Working in a sultry and humid office reduces productivity, increases anxiety and lowers your overall performances. This is why fresh air is one of the major prerequisites for a creative and efficient work environment. Of course, you can achieve high air quality in the office in many different ways, but some of them are more effective than the others, while some should be used under no circumstances. The most logical step in making your office into a pleasant work place is turning to natural air sources. The ones that should be used before any artificial devices are the windows and the doors. In summer months, a few windows should be left opened all night long, so that the space gets enough cool from the outside. However, this should be applied only on high storeys, since leaving ground floor windows opened at night could result in a lower number of equipment items in the morning. In addition, consider leaving the windows ajar, both at night and during the work hours. On the other hand, in winter it’s recommended to leave the door open between different offices, so as to let the air circulate throughout the building. The benefit of this method is two-fold. Firstly, you’ll exterminate sultriness. Secondly, you’ll ensure a free flow of warmth and energy. Since a significant number of younger employee’s days suffer from allergies, office managers should take care of such people, too. In their case, opening windows and doors to improve the air quality won’t be enough. What you need to ensure are relaxing work conditions for such employees and quality air purifiers might just ensure that. 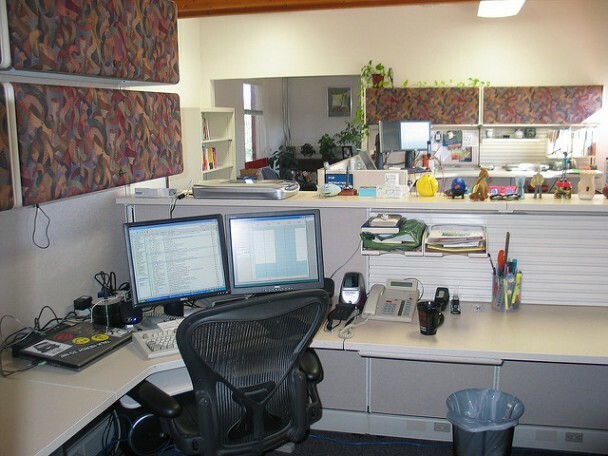 In addition to cleaning the office air from mites and dust, they’ll also remove the mold from the air, which will have a beneficial effect on all the other workers, too. Likewise, if you want to reduce the risks of allergens in the office, carpets should be excluded from your office inventory list. Always opt for rugs, since they are easily cleaned and allergen-unfriendly floor decorations. The great thing about fans is that they increase the air quality in the office and at the same time decrease the feeling of warmth, even though they don’t decrease the temperature in the room. What’s more, they also consume less electric energy than air-conditioners [source]. Since they’re also less expensive than AC-units, they seem like great aides to your air office policy. When it comes to fan types, the best option is to go with pedestal fans in regular offices and install ceiling fans in conference rooms and similar larger spaces. Having them covered with fans will reduce the need for air-conditioning, which is extremely important when elderly business people are coming to business negotiations. Apart from that, they can also be used in winter, to break the sultriness from central heating. We’re all asked to look nice at work (except for the programmers). However, this doesn’t mean that you should pour a half of a perfume bottle on your neck before you go to work. Since people often use too much perfume and cologne, as well as other scent-inducing agents, every business owner or office manager should bring some scent-regulating rules, in accordance with the guidelines given by the professionals of occupational medicine. That way you will protect the employees suffering from different respiratory illnesses, as well as keep the air in the office fresh. The question of air quality in the office is both a health and efficiency issue. Because of that, it’s crucial to set some rules to keep the office as refreshing and inspiring as possible and retain the productivity on a high level.